Elly Fountain Game - The Munching, Flapping, Aquirting Elephant Board Game! From John Adams, the same company that brought you the multi-award winning Pig Out! game comes the Elly Fountain Game. This children's action game from John Adams is described as a "munching, flapping, squirting elephant game!". Elly is always hungry and players have to feed her with her favourite bananas, apples or peanuts. Randomly though, she may spray the feeder with a squirt of water out of her trunk! That’s actually quite lucky as it means the player can take a ‘splash coin’. Even though you may be a bit wet, the winner is the first person to pick up three of these coins! 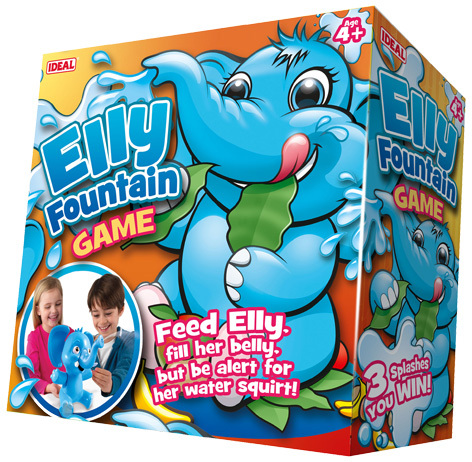 Great fun for children of 4 and over, the Elly Fountain Game is hilarious fun for two to four children as they dodge the intermittent water sprays! Please tell us what you think of the Elly Fountain Game by John Adams.